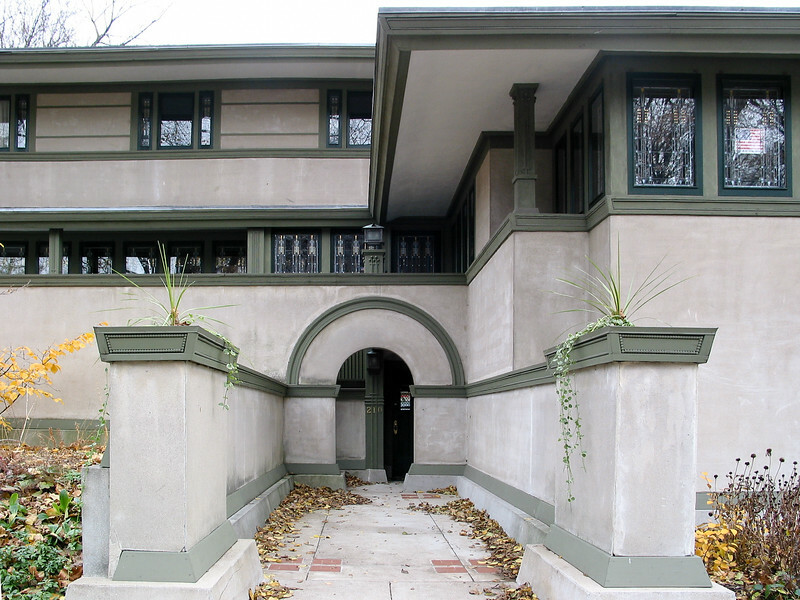 Oak Park, a suburb of Chicago, IL, is distinguished in architectural circles for being the first professional home of Frank Lloyd Wright. At the start of his career, in the 1880s, it was on the edge of the prairie, but already where the wealthy were building their homes. Today, it possesses an astonishing collection of wonderful houses and other buildings from around the turn of the century, not only Wright's firsts, but also fine examples of "Victorians" (Queen Anne and Stick styles), Shingle, Arts & Crafts, and of course Prairie styles. It's remarkable to see all these houses in juxtaposition; almost all the ones pictured below are on just a couple blocks of a single street, Forest Avenue! And there are dozens more of similar quality in Oak Park and neighboring River Forest. I also visited Unity Temple. This Universalist church is one of Wright's masterpieces. It still looks strikingly modern almost 100 years later. Designed in 1905, it was built with reinforced concrete cast on site. This construction saved a lot of money, and provided sound insulation against the busy street outside. It is stilled owned and operated by the congregation.